Have you ever had a caprese salad? Thick sweet juicy tomatoes topped with basil leaves, soft creamy fresh mozzarella and finished off with balsamic vinegar and olive oil. 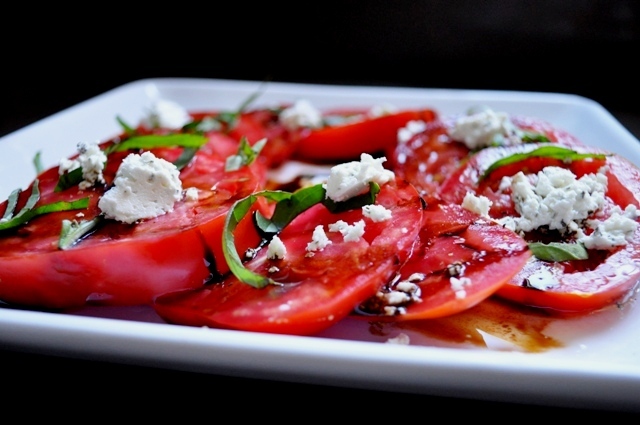 It's one of my favorite salads and one of my favorite ways to enjoy ripe summer tomatoes. I decided to do a play on this delicious salad and twist it up just a bit using some fresh made basil goat cheese that Hubby and I picked up at last week's farmer's market in place of the mozzarella. The other twist was to use a balsamic vinegar reduction that I saw recently on the The Pioneer Woman Cooks (check our her site to see a gorgeous caprese salad). 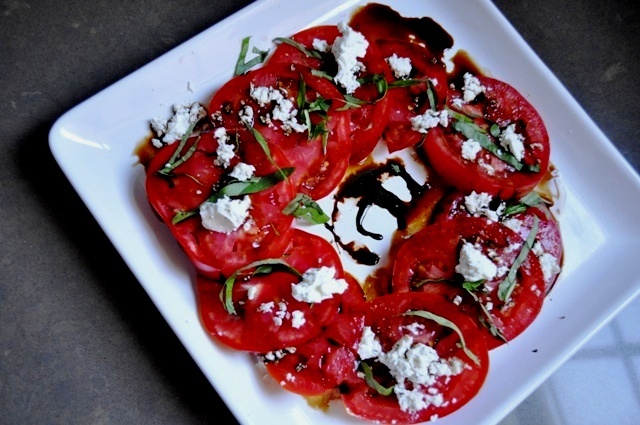 The balsamic reduction is so sweet and lovely and perfectly compliments the basil goat cheese, fresh basil and luscious tomatoes. This summer tomato salad with basil, goat cheese and balsamic reduction is the final salad in the Trio of Summer Salads that Hubs and I enjoyed last weekend. Since I love caprese salad, it's no surprise this was one of my favorites in the trio. This salad is all about the tomatoes. Maybe you have some nice ripe fat sweet tomatoes growing in your garden, or available from your local farmer's market? 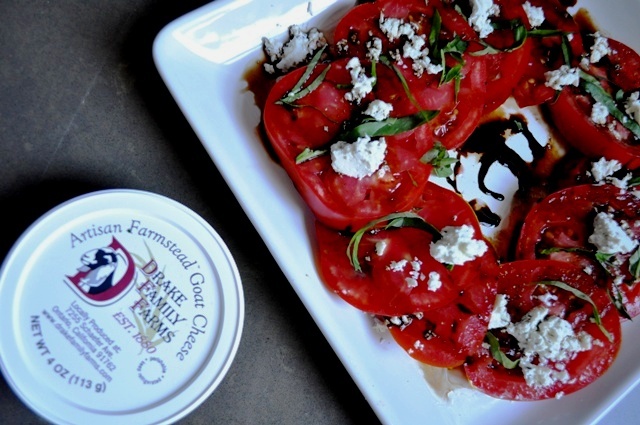 I really loved how the creamy mild basil goat cheese enhanced the tomatoes and balsamic reduction. Simple ingredients, yet bursting with flavor. One note about the balsamic reduction. It thickens quite a bit after it cools...so be careful not to overcook. I started with 1/2 cup if balsamic vinegar and ended up with way more than I needed. I recommend using 1/4 cup and cooking it no more than 3 - 5 minutes if you don't want your balsamic to turn into tar. You can make more reduction if you have other dishes to use it on and you can store it in the fridge. This salad is easy to make and incredibly delicious! Give it a try! Using a small sauce pan on medium low heat, cook down balsamic vinegar until slightly thickened, stirring with wooden spoon frequently, about 3-5 minutes. Remove from heat and set aside to cool. Stack basil leaves on top of one another and starting at one end, roll the stack up into a little mini cigar. Using your knife cut 1/4 inch thick ribbons starting at one end of the roll until you make your way all the across. Wash tomatoes and dry. Slice tomatoes 1/2 inch thick, discarding the slice containing the stem end of the tomato. Place tomatoes on serving plate and season the top side of each tomato slice lightly with sea salt and fresh cracked pepper. Using a fork, crumble generous bits of goat cheese on top of the tomato slices, ensuring that each slice has least a teaspoon of cheese. Drizzle the balsamic reduction over the tomatoes. Use as much (or little) as you like. Drizzle olive oil over the tomatoes and lastly, top with the ribbons of basil. Serve immediately. What a delicious twist on a regular caprese salad; it looks wonderful. I will have to try the balsamic reduction - it sounds like it would be fabulous with lots of things.